Daily Bible Verse 101: Unless the Lord builds the house, the builders labor in vain. 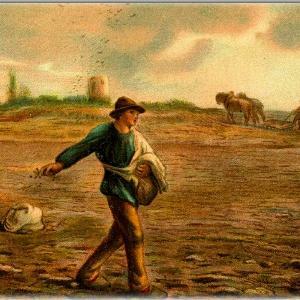 "Jesus said, “This is how it is with the kingdom of God; it is as if a man were to scatter seed on the land and would sleep and rise night and day and the seed would sprout and grow, he knows not how. (Mark 4: 26 - 27). What is your notion of apostolic work and endeavor? Hard work, boisterous energy, personal investment of time, talent and treasure? Jesus says that the Seed Grows of Itself, that is, by the power of God and not by anything you or me can contribute. So be humble and learn what this means. Unless the Lord watches over the city, the guards stand watch in vain. In vain you rise early and stay up late, toiling for food to eat — for he grants sleep to those he loves." (Psalm 127: 1 - 2). "Of its own accord the land yields fruit, first the blade, then the ear, then the full grain in the ear. And when the grain is ripe, he wields the sickle at once, for the harvest has come.” (Mark 4: 28 - 29). How much does God need and depend on our hard work and services? As much as a mother busy in the kitchen needs the "hard work and services" of her one year old daughter. But yet, we all have a part to play to evangelize the world. This is the mystery. "Go into the whole world, and proclaim the Gospel. I am with you always, says the Lord." (Mark 16: 15; Matthew 28: 20 RM).